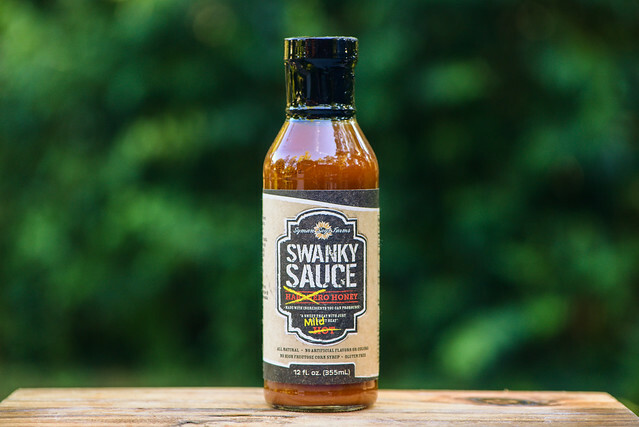 Quality ingredients and great progression of flavors that include sweet, fruity, tangy, earthy, and spicy makes Swanky Sauce Mild Honey a great choice to handle almost any of your grilling or barbecue needs. What to do when you have a habanero crop that's run amok? For Aaron and Liz Syman, the answer was to make barbecue sauce, and a lot of it. This is how Syman Says Farms in Salem, CT got into the world of barbecue sauce production, and once they realized they were on to a good thing, they took the next step to bottle and produce their sauce en mass. They've received some good praise on their efforts to date and won Grand Champion in The Saucekers barbecue sauce competition this summer. For those not as into the extreme heat of their Habanero Honey sauce, the Syman's recently added this mild version that continues to focus on the same quality ingredients of the original, just with less of a kick. The initial whiff of this sauce fills the nose with a tart and earthy aroma that has a deep tomato base behind it. The tomato tilts more acidic than sweet, and there's a mustard pungency that mixes in well. With some deeper smells, an array of additional seasonings make themselves known, which include onion, garlic, and a lightly smoky chili. This semi-glossy sauce has a rusty orange hue and, while opaque, it's not hard to see the specs of black, red, and white spices throughout. Some of these bits are on the larger side, which gives the sauce a slight texture to it. It's consistency is medium-thin and it has a fast, uneven pour off of a suspended spoon. A few final drips release fast, and a thin coating is left clinging to the silverware, in which you can more clearer see what looks like bits of onion and garlic. 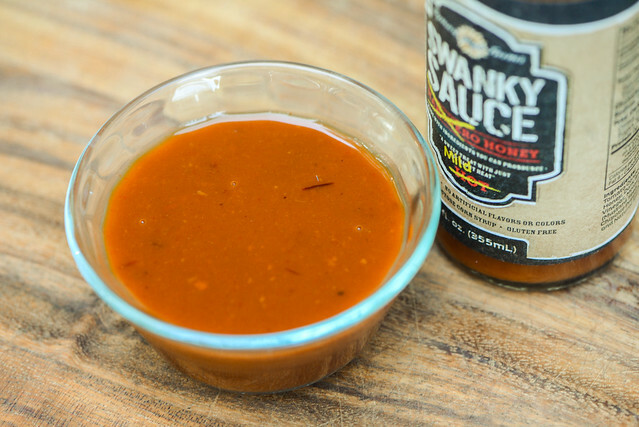 The sauce has a sweet start with a smooth honey flavor. Tomato mixes in quickly, but retains its deep, acidic character rather than tilt to a sugary, ketchup-like profile. As the sauce settles on the tongue, a prominent onion comes out, followed by a bit of mustard and garlic right before the vinegar starts to turn things tart. As sauce quickly flips from sweet to tangy, an earthy heat hits, and as it builds in spiciness, also adds a faint smokiness as well. Although all the flavors are pretty strong, the sweet honey never completely fades, and this creates a final aftertaste that's a nice balance between heat, sweet, and spicy. This sauce coated the chicken in a thin, even layer that baked down well and gained heft after multiple brushings over indirect heat. When moved to direct heat, there was little caramelization and just a tad bit of burn off. The initial flavor was more subdued than out of the jar, with the sweetness remaining, but the tomato and spices less prominent. After multiple bites though, a lot of that came back, along with the tanginess and heat. This gave the leg an overall great, robust flavor by the time I was done with it. I was a big fan of the Habanero Honey, and being more of a spicy sauce guy, was a little dubious of a version that took things in a sweet and mild direction. Swanky Sauce didn't disappoint here though as it managed to retain its quality and excellent progression of flavors, including heat, just without the hiccup inducing spiciness of the original. Its semi-thin consistency means it would do well slathered on a pile of pork or used as dip, while its good performance on the grill also makes it well suited for saucing chicken, pork, fish, and the like. 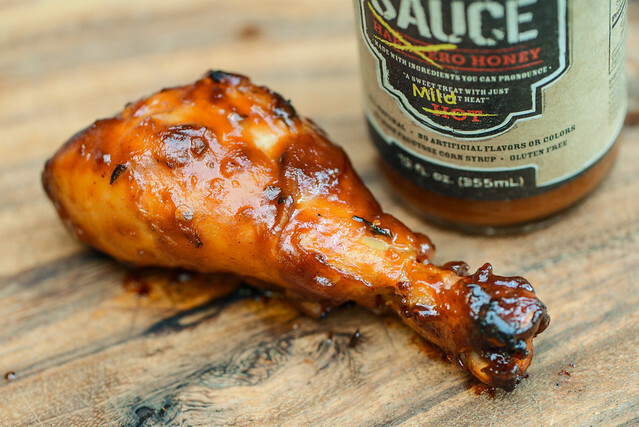 So if you're looking for an excellent all-purpose sauce and are a little turned off by the extreme heat of the Habanero Honey, I wouldn't hesitate getting Swanky Sauce Mild Honey to fulfill most of your grilling and barbecue needs.